Kick Key Lime Pie to the curb. There's another "K" name destined for the next version of Google's Android mobile OS. Google today announced through a myriad of channels that Android 4.4 will be called "Android KitKat," like the "break me off a piece of that" treat by Nestle. The pick continues Google's tradition of christening its OSes after sweets. However, while other names take after generic desserts (Gingerbread, Ice Cream Sandwich, etc. ), 4.4's moniker belongs to a trademarked product. According to John Lagerling, director of Android global partnerships, speaking to the BBC, there's no money being dealt between Google and Nestle. However, there's still plenty of cross promotion to be had, as Nestle is launching a contest by which consumers can win a Nexus 7 or Google Play credit through specially branded Kit Kat bars. Lagerling said Google approached Nestle about using "KitKat," and Android 4.4 drops the space between Kit and Kat. It took the confection maker an hour to give the OK, Nestle's marketing head told the BBC. Sundar Pichai, head of Chrome and Android, tweeted the picture you see above earlier today, also sharing that there are now over one billion Android activations. The giant chocolate droid now occupying the company's Mountain View campus, he wrote, will hopefully keep the OS' momentum humming along. There's a KitKat landing page up and running, complete with details on the Nestle contest. Pichai also humble-bragged about Android's accomplishments on his Google+ page, simultaneously dropping a #AndroidKitKat plug in his post. "It's our goal with Android KitKat to make an amazing Android experience available for everybody." If you're wondering what's up with Key Lime Pie, according to Lagerling the Android team realized late last year that "very few people actually know the taste of a key lime pie," thus opting for the familiar chocolate bar (and favorite late-night Google snack) for the next Android instead. Internally, only a few people knew Android 4.4 would be called KitKat, with Key Lime Pie serving as a codename both with employees and partners, he said. That's not to say Key Lime Pie is being discarded for good, though Lagerling made no allusions to that possibility. We could still see Android 5.0 stick to KLP, perhaps after Google's passed out a few slices to prep the public's palate. 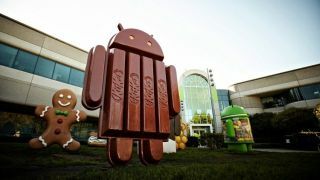 Until then, plenty should get a taste of chocolate-covered wafer goodness, as the BBC reported Nestle will deliver over 50 million Kit Kat packages stamped with Android's little green guy to 19 markets. Among them are the U.K., U.S., Russia, Japan and Brazil. Snap, crackle and pop your way to our Chromecast review.